Earlier to this post, I have written couple of posts to get started with Oracle Cloud. 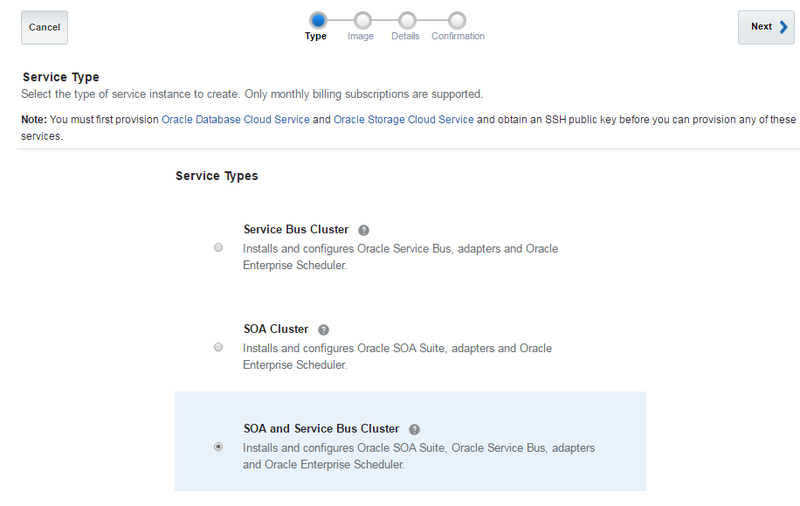 In this post, I will show you how to create instance of Oracle SOA Cloud Service. There are some pre-requisites that you need to fulfill as mentioned below, before you proceed with this post. 1. Create Oracle Storage Service Container. Refer this post to create the container if already not done. 2. 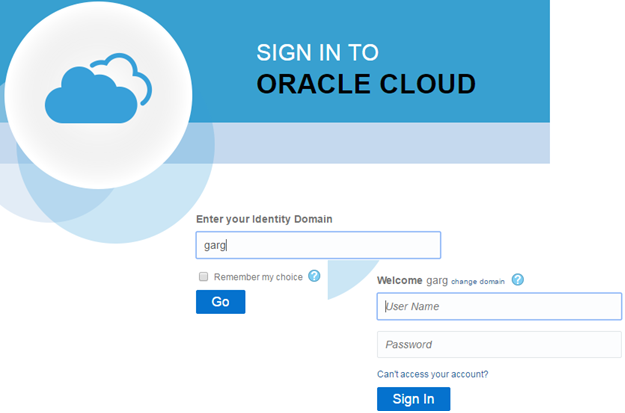 Create Oracle Database Cloud Service Instance. Refer this post to create the instance for Oracle Database Cloud Service if already not done. Click on “Service Console” option as shown in below screen shot in “Oracle SOA Cloud Service” section. Click on “Create Instance” button to initiate the process of Instance creation. Step 2: Services Type: Here you need to choose service type that has multiple options. You can select SOA and OSB cluster if need to use both the tool or choose any other option as per your requirement. Step 3: Image: Here you need to choose the version, for this post, I have selected latest version which is 12.2.1. 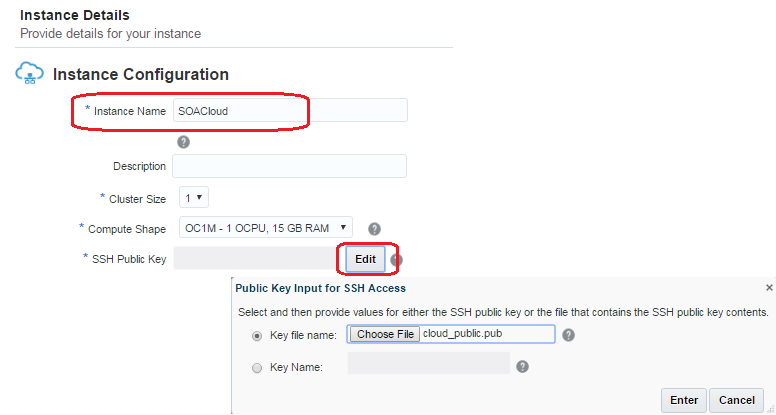 Step 4: Details: Here you need to fill all required details to create SOA cloud instance. First go to “Instance Configuration” and fill Instance name along with description if needed. For this post, I have given “SOACloud” as instance name. Change the cluster size if needed as by default it will be “1” and change computer shape in needed. You need to browse the public key file that you have created earlier. Now fill details for admin user credentials. In later posts I will use same user to login to various consoles. Now enter required data base details like Database Service Name, PDB name, user credentials. All these details you get when you create Database cloud service instance. You also need to enter details for Storage container and you get these details when you create Oracle Storage Service Container. Step 5: Confirmation: Review the detail and click on create to create to the instance. Once you complete all above step, you see below screen. Have you worked with MFT?